Contrary to popular opinion, Melanchthon never served as a parish pastor. Unlike Luther, he was not known as a preacher. But as John Schofield points out in his work Philip Melanchthon and the English Reformation, his 1519 Bachelor of Divinity degree earned at Wittenberg and his appointment to the faculty at the University of Wittenberg made him the first ordained professor of Greek in Germany. In 1525, he and Luther received special permission to read and teach whatever they desired at the University, though Melanchthon continued to teach Greek. For Melanchthon, Greek was more than a subject to learn and teach; it was the root of learning, and he believed that a poor knowledge of Greek leads to poor theology. In place of Luther, who remained under the imperial ban, Melanchthon became the spokesman of the Reformation at imperial diets, princely halls, and theological colloquies. This development shows an amazing development in the fight against the late Medieval Scholastic Roman Catholic view of infused righteousness, and in many ways, it was the heart of the Reformation. It is in the development of the doctrine of forensic justification by faith that Melanchthon made his chief contribution to Reformation theological development. The proclamation of God’s free grace declared to the sinner on account of the person and work of Christ Jesus was the mainstay of Melanchthon’s doctrinal development. As this singular permeated his intellectual world, it led him to develop the Reformation message systematically. The loci or topical method which Melanchthon used for “doing theology” necessitated that he identifies one central topic or doctrine and then build all other doctrines off of that central teaching. For Melanchthon, salvation by grace alone, through faith alone, on account of Christ alone was the center. This is clearly seen in both his Loci Communes, the Augsburg Confession, and the Apology to the Augsburg Confession (Apology). 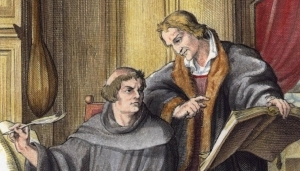 Melanchthon’s theological career can be segmented into three distinct periods. Period one was the early years. During this period, Melanchthon began to lecture and produced the first editions of the Loci Communes. Period two was the era of heavy work and theological maneuvering. This period followed the writing of the Augsburg Confession and the Apology and represented a period of intense writing and theological ambassadorship on the part of Melanchthon. Lastly, the third period was after Luther’s death and was characterized by scandal and chaos both within Lutheranism in general and Melanchthon’s life and works more specifically. Unlike Luther, in later life, Melanchthon was less clear and lucid in his theological developments. Melanchthon’s later theological developments underwent changes as he made unfortunate concessions that often cause modern theologians and historians to regard him as a betrayer, synergist, and a crypto-Calvinist. In most cases, the true impact of his later theological changes is overstated. Many of the charges that have been levied against him, though in some cases true of his followers, were not necessarily true of him. Charges of synergism, crypto-Calvinism and works righteousness would be difficult to prove from a reading Melanchthon’s own theological writings drawn from the primary sources. Nonetheless, Melanchthon made several unfortunate changes to his writings that at best left followers and supporters of Luther confused and at worst left them feeling abandoned by Melanchthon. He made at least three major sets of changes to the Loci Communes and on multiple occasions re-wrote the Augsburg Confession. The name of Melanchthon has often been associated with controversy and divergence from the “Lutheran Norm” or “Authentic Lutheranism.” This is an unfortunate legacy for one of the fathers of Lutheranism, the Lutheran Confessions, and Lutheran systematic theology. His influence spans far beyond the controversy and can be seen not only in the writings of Luther but in the later Lutheran Confessions, most notably the Formula of Concord, as well as in the doctrinal development of later Lutheran orthodoxy. At worst, his legacy is one of a confused contemporary and progeny of Luther. At the very least, he ought to be considered an influential reformer and original rediscoverer of the doctrine of imputation and forensic justification by faith alone. As a brilliant scholar and inept leader, his work ought not be discounted due to his lack of seeming fortitude. Luther he was not, but those of us who hold historical Lutheranism to be a correct exposition of biblical doctrine owe much to this man, the quintessential bookworm of the Reformation.